Replacement for any Dodge RAM 1500 SRT10, V-10, 8.3L PCM - ECM Engine controller module fully programmed for your specific RAM SRT10 by VIN. 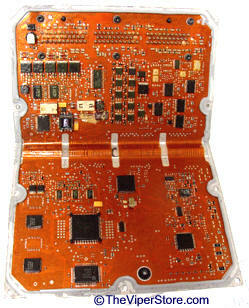 NEW Dodge Engine controller module or PCM - ECM. This is a new stock 2004-06 RAM SRT10 8.3L PCM from Chrysler but may be of a different year than your truck. Because these PCM's are not made any more and none are available anywhere - we have taken another NEW RAM SRT10 New PCM directly from Chrysler and modified it to be specifically the year and transmission of your RAM SRT10 8.3L truck. 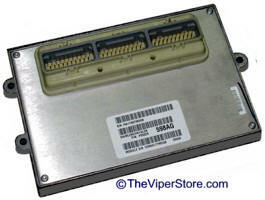 This PCM will work in your RAM SRT10 like a new factory PCM - guaranteed. Tested on many RAM SRT10 automatic and standard transmission and works great. 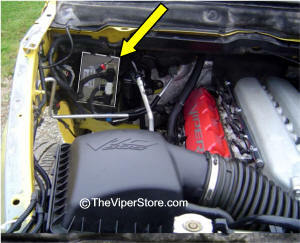 Dodge no longer makes PCM's or the Dodge RAM SRT10 2004-2006. We have new and new rebuilt factory PCM's in stock. For 2004-05 Ram SRT10's you may want to have a dealer program your SKIM module. PCM processor code shown on the PCM above. in your VIN and Mileage into your SKIM module. *PCM's have a $500.00 core charge. Once you send us your old one and it is inspected you will be refunded up to $500.00 depending on the condition of the PCM..
UP = Un-Programmed for your vehicle. NOTE: The Ram SRT-10 PCM is located on the Passenger inner fender. This service is for you to send us your RAM SRT10 PCM and for us to inspect, test and analysis it. We sill determine the repairs and give you the cost to repair it. Service includes diagnoses. 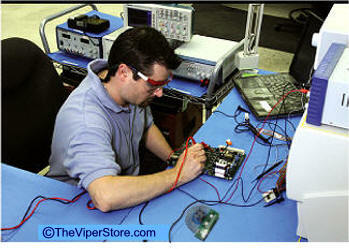 Repair is additional based on estimate from lab. A typical repair cost is an additional $300.00 to $550.00. $ 225.00 plus shipping. To Diagnosis the problem and estimate repair cost. It will be your choice whether to repair the unit or not. NOTE: a typical repair cost is around an additional $300.00 - $550.00. We will not proceed with repair until you authorize it.